Peter Cannon: Thunderbolt #1 is out 1/30/2019. 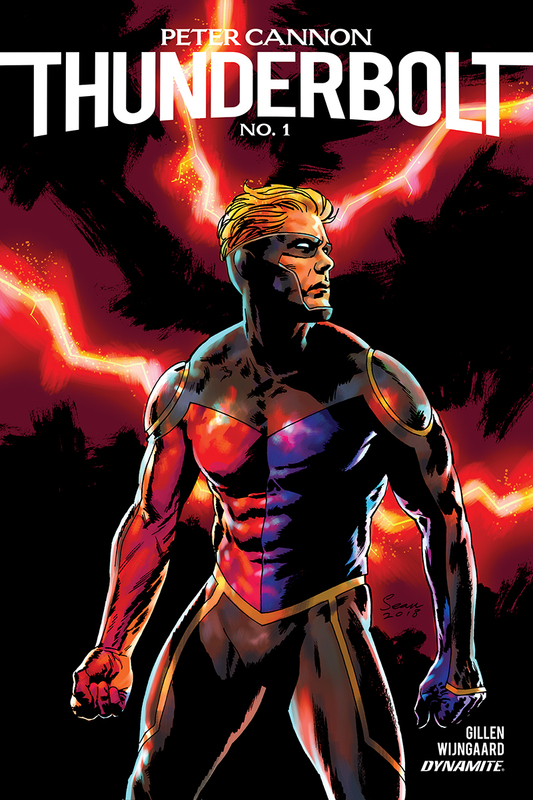 So, what’s up with this new Peter Cannon: Thunderbolt comic book then? Well, it certainly has the right creative team, or at least one that I’d deemed A List. Kieron Gillen is one of the bigger names in monthly comic book writing, having worked on a number of beloved runs at Marvel Comics as well as notable creator-owned books liked The Wicked + The Divine and, most recently, Die (which rules, btw). Providing the art is Casper Wijngaard of the severely under-appreciated creator-owned comic, Limbo, and his work is brought to such vivid life here by colorist Mary Safro. This is, indeed, a very visual comic book, which sounds odd to say about a medium that’s always very visual, but it’s true: this book brims with gorgeous splash panels, drawn by Wijngaard and Safro. In fact, more than any of Gillen’s other recent new books—his work on Star Wars, Die—it feels like he spends much of this comic trying to get out of the way here, letting the visuals carry readers through the rudimentary stuff, the introductions to the world, the people, the threat it faces, and the way Cannon is almost immediately able to concoct a solution. Gillen really makes his presence felt at the end, however, when he shows his hand and unveils the conceit of this comic: this book borrows pretty directly from the plot of Watchmen in some really crucial ways. Not to go too far into spoiler territory, but both the reason the threat has come to Earth and the person who sent are essentially right out of the pages of Alan Moore and Dave Gibbons’ seminal comic. This has been a controversial artistic move in the past when done by the property’s actual corporate owners, DC Comics, but I imagine (relatively) small fry dynamite and indie comics good will hoarders like Gillen and Wijngaard will be given the leeway to tell an intriguing story with this concept. Besides, Ozymandias himself was essentially borrowed IP from the original Peter Cannon: Thunderbolt, which sends my mind down an infinite rabbit hole just thinking about it.